What is “dual bonded” cable? It’s a great way to save time. Dual bonded cable is a pair of cables that have been molded together so you can run them as one. It makes it easy to run cables from place to place quickly. Why wouldn’t you want to get through an installation faster? Some dual bonded cables are simply RG6, while some also include a ground wire to make things even easier. Some carry electrical or network cable as well as coaxial cable. It all depends on your need. Dual bonded cables were much more common in home installations in the 2000s when every DVR needed two cables into it. Today’s installations only require one cable per box so dual bonded cables aren’t seen as often in homes. They’re still common in industrial installs, because industrial and commercial dishes have four or six outputs. 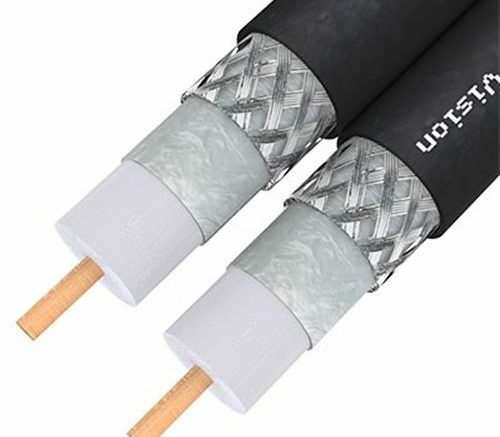 With dual bonded cables, you only have to run two or three lines instead of four or six. You’re still using as much material and you’re still taking up the same amount of space, but it’s easier to manage and that makes the job go faster. In a pinch, most dual bonded cables can be pulled apart to make single cables without damaging them. If you’re looking for the best RG6 cables, I’d appreciate it if you take a look at SolidSignal.com, the folks who keep the lights on here at this blog. They have a truly impressive selection of cables for pretty much every need and can even custom order the cables you want. Give them a call at 877.312.4547 and you’ll get a representative who is happy to help! Did you know that SolidSignal.com could turn your car into a cop car?